A comedy variety show starring Jim Henson’s lovable Muppets. Each episode features a special guest star as well as song and dance numbers, parodies, and skits. Backstage at the Muppet theatre, Kermit the Frog (Jim Henson) tries to maintain some sense of order with amongst dozens of crazy characters. 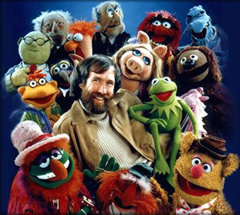 They include comedian Fozzie Bear (Frank Oz), strong-willed Miss Piggy (Frank Oz), self-described weirdo Gonzo the Great (David Goelz), gofer Scooter (Richard Hunt), inventor Dr. Bunsen Honeydew and his assistant Beaker (David Goelz and Richard Hunt), and boomerang fish thrower Lew Zealand (Jerry Nelson). Heckling the performers from the audience balcony are curmudgeons Statler and Waldorf (Richard Hunt and Jim Henson).